The North Island (Māori: Te Ika-a-Māui) is one of the two main islands of New Zealand, separated from the South Island by Cook Strait. The North Island is 113,729 square kilometres (43,911 sq mi) in area, making it the world's 14th-largest island. It has a population of 3,450,800 (June 2014 estimate). 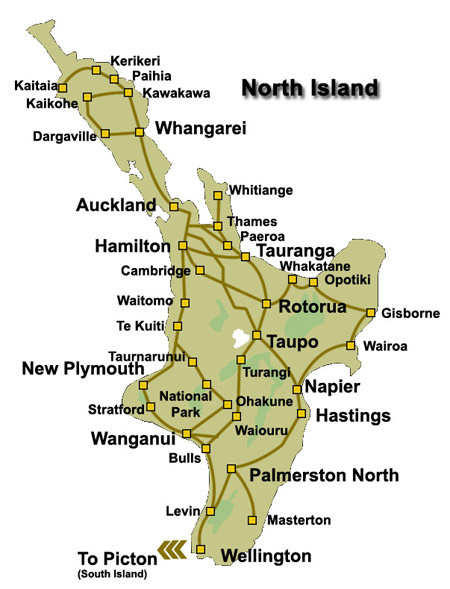 Eight important cities are in the North Island, notably New Zealand's largest city, Auckland, New Plymouth, Tauranga, Gisborne, Napier, Hamilton, Palmerston North and Wellington - the capital, located at the southern extremity of the island. Approximately 76% of New Zealand's population lives in the North Island. According to Māori mythology, the North and South Islands of New Zealand arose through the actions of the demigod Māui. Māui and his brothers were fishing from their canoe (the South Island) when he caught a great fish and pulled it from the sea. While he was not looking his brothers fought over the fish and chopped it up. This great fish became the North Island and thus a Māori name for the North Island is Te Ika-a-Māui (The Fish of Māui). The mountains and valleys are said to have been formed as a result of Māui's brothers' hacking at the fish. Until the early 20th Century, an alternative Māori name for the North Island was Aotearoa. In present Māori usage, Aotearoa is a collective name for New Zealand as a whole. The North Island is made up of six unique geographical regions ranging the northern temperate kauri forest regions to the volcanic plateau in the centre of the islands to the farming landscape to the south of the island, including New Zealand's longest River - the Waikato River. The North Island has its own natural scenic beauty and popular tourist activities include sightseeing, adventure tourism, such as Bungee jumping, tramping (hiking), kayaking, and camping. Numerous walking and hiking paths in the the many National Parks including the famous Tongariro Crossing hike locate in North Island's volcanic plateau, (often called the Central Plateau and occasionally the Waimarino Plateau), that covers much of central North Island of New Zealand with volcanoes, lava plateaus and crater lakes home to Mount Tongariro, Mount Ngauruhoe, and Mount Ruapehu. The North Island has two major world class skifelds - Whakapapa Skifield located near National Park and Turoa Skifield located near Ohakune. These skifields are located on the slops of Mount Ruapehu and can reach by regular train and bus/coach services from most locations in the North Island. The North Island has 4 major national parks, being Te Urewera Conservation Park, Tongariro National Park, Whanganui National Park and Egmont National Park.